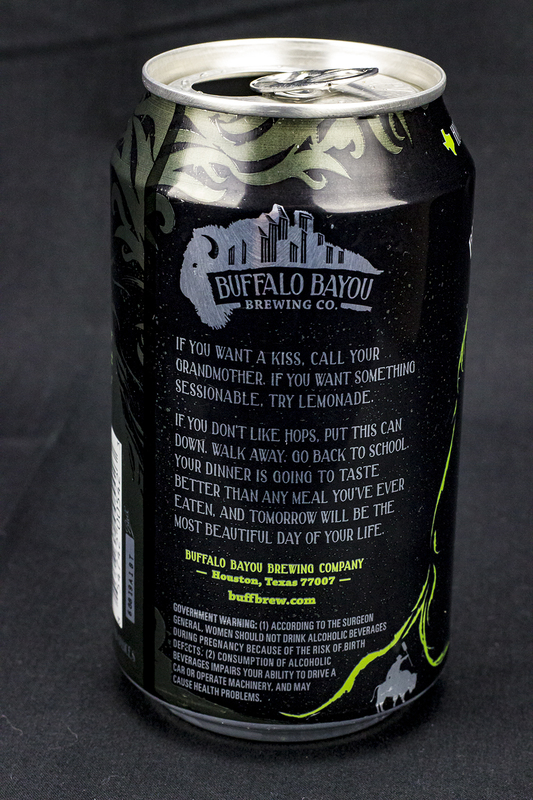 Brewery: Buffalo Bayou Brewing Co. Character: Brewed with a West Coast malt bill, and added rye malt. I really do love it when friends of mine are able to hand over beers for me to review. That is the case here with this awesome Rye IPA from Houston’s Buffalo Bayou Brewing Company. My friend Anthony Ascherl, a Tapmaster at my favorite Craft Beer bar, Big Hops Huebner gave me this beer can, just cause he was being nice, and awesome! I thank him from the bottom of my beer soaked heart! The brewery kept the can pretty simple, but threw in some awesome verbiage all over the can, which pleases me. 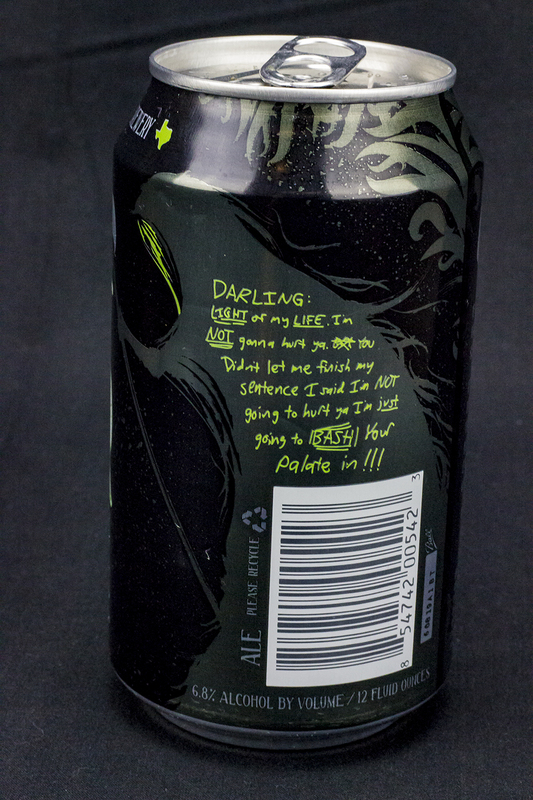 The name of the beer is written in big letters on one side of the can, with the “R” in RIPA being backwards and green, a different color than the rest of the words. This title is sitting under a large scythe that is being held by a grim reaper. Within the reaper’s body there is an amazing quote from the movie, The Shining, but with a small twist. The other side of the side has a great comical commercial description of the beer. (Both pictured below). The can’s main color is near black with highlights in neon green. Simple, but eye catching. I poured this beer into a specialty glass designed for IPA’s by Spiegelau. The beer’s appearance was a hazy bright golden orange color which was topped with a large 1.5 inch white foamy head. There was great head retention as it stayed around the entire session, leaving large lines of lacing down the glass. The aroma was high in hops up front with an scents of citrus orange peel, papaya, guava, mango, pineapple, with a bit of danky resin. The malt comes through fairly light behind the hops with hints of rye spice, black pepper, and fresh baked biscuits. I love the spiciness of the rye malts that lingers in the nose with the citrus orange peel and danky resin. 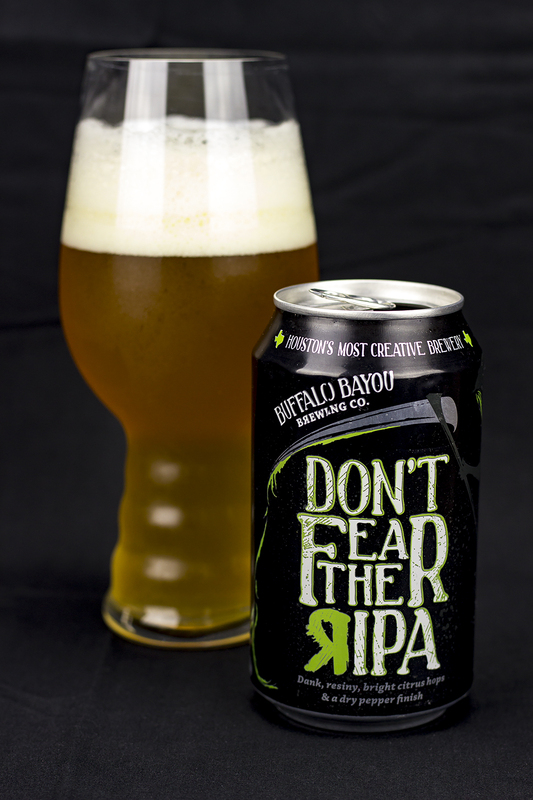 The taste of Don’t Fear the RIPA was similar to the nose. The bitter spicy citrus orange peel, and tropical fruit flavors from the hops hit the palate first. There was a nice mixture of papaya, guava, mango, and pineapple blended with some danky resinous hop characteristics. There was some light malts shining through including some black pepper spiciness from the rye malt. The dry peppery spice from the rye lingers in the aftertaste blended with citrus orange peel and some dank resinous flavors. The body was a bit on the heavy side with an astringent, and spicy mouthfeel. The added rye added a nice dryness to the finish, which is my favorite part of Rye IPA’s. Overall, this beer delivered, and brought it’s A game! A true winner by Buffalo Bayou Brewing here. I really do love Rye IPA’s. It’s one of my favorite styles of beer. The flavors really pop here, and the body and finish are perfectly matched with the flavors. I look forward to getting my hands on more cans if this beer. I really want to taste it on draft. I bet it’s amazing! 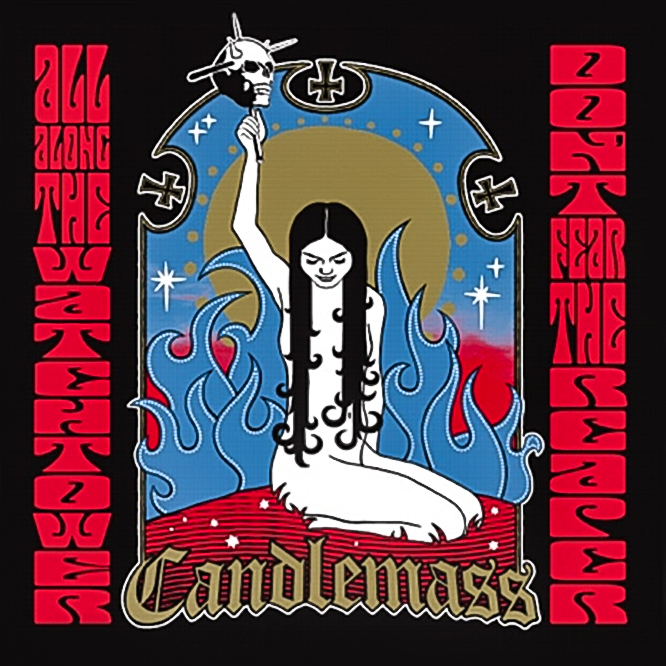 Metal Connection: This isn’t the first time I have used the Swedish Doom Metal band Candlemass here on this site, and I’m sure this won’t be the last either. I’m sure you are all wondering why the Hell didn’t I just use the Blue Öyster Cult song “(Don’t Fear) the Reaper” for the Metal Connection with this beer. Well, that answer is simple. I personally love cover songs, and I mean just listen to this Doom Metal version of this classic Rock hit. Candlemass slows this tune down a bit, and the melancholy lyrics fit so well with this creepy vibe put out in this version of the song. Fellow Texan, Robert Lowe fronted Candlemass from 2006-2012, which included the Don’t Fear the Reaper EP with this song, along side another cover song, “All Along the Watchtower” by Bob Dylan. Mr. Lowe is one of my favorite vocalists, as his work with Candlemass was amazing, and he is also known for his fronting of the Texas Doom Metal masters, Solitude Aeturnus. Crank this baby up and prepare to be blown away by the heaviness of this cover version of (Don’t Fear) the Reaper.